A hurricane warning was posted for Mexico's western coast between San Blas and Mazatlan. Tropical storm warnings were raised from Playa Perula to San Blas and north of Mazatlan to Bahia Tempehuaya. The centre said Willa is expected make landfall late Tuesday or early Wednesday. Willa had maximum sustained winds of 249 km/h early Monday and was centred about 315 kilometres south-southwest of Cabo Corrientes. It was moving to the north at eight km/h. Hurricane force winds extended out 40 kilometres from the storm's core and tropical storm force winds were up to 145 kilometres out. 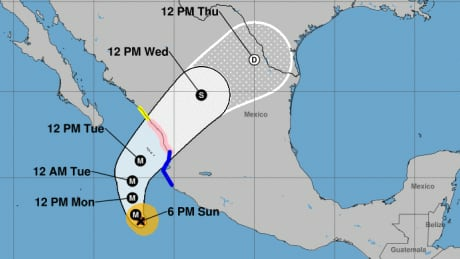 The hurricane centre said 15 to 30.5 centimetres of rain should fall — and some places could see up to 46 centimetres — on parts of Mexico's western Jalisco, western Nayarit and southern Sinaloa states, raising the danger of flash flooding and landslides in mountainous areas. Its core was about 355 kilometres southeast of Acapulco with top sustained winds of 65 km/h late Sunday. The hurricane centre said it could produce 7.5 to 15 centimetres of rain in parts of Guerrero, Michoacan, Colima and Jalisco states.